Causes of limb loss and how to help a tri-pawed rabbit. Limb loss refers to the amputation (surgical or otherwise) of one or more of a rabbit's limbs. Most rabbits who are missing limbs are missing only one, so this page primarily refers to those "tri-pawed" bunnies. What Causes a Rabbit to Lose a Limb? Some rabbits may be born with (or acquire soon after birth) some kind of defect that involves a malformed or missing leg. Others may need amputation as a way to stem disease or infection. The most common cause for amputation is a leg fracture caused by external trauma to the leg. While not all leg fractures necessitate amputation, those that are not able to heal on their own or with surgical assistance may require the leg to be amputated. What Causes a Leg Fracture? A leg fracture occurs when injury or damage is done to the leg, causing the leg to crack or break. A leg fracture can be caused by mishandling, improper restraint, poor caging (say, if a rabbit gets their leg caught in between pen bars) or some other form of trauma. How is a Leg Fracture Treated? Depending on the location and severity of the injury, your vet may try to repair the leg through the use of a splint or pin, or may choose to remove it altogether. Sometimes, your vet may try to repair the leg but be unsuccessful, thereby necessitating removal. A leg may be amputated at the point where the leg meets the body or, in rarer cases, amputated at the elbow or knee. Amputation surgery is relatively low-risk and generally successful. There is some home care and surgery aftercare required, but it is manageable and your rabbit can be on his or her way to recovery very soon. What Kind of Supportive Care do Rabbits with Missing Limbs Need? Tri-pawed and other missing-limbs rabbits will have some special care needs beyond those of a rabbit with all four legs. Slippery flooring is a big problem for a missing-limb rabbit. They will need an enclosure with flooring that provides plenty of traction to help prevent them slipping and sliding. Cotton towels, rugs or fleece are great options. A rabbit who is missing a back limb will need help with ear cleaning. See our page on Ear Care for more information. They may have trouble balancing when grooming, eating or performing other tasks. Consider lining their pen with some rolled towels tied with jute twine or sisal rope (to prevent unraveling) or adding a stuffed animal for them to lean against when they need help. Keep a careful eye on the remaining feet and, if applicable, the stump of the removed leg. 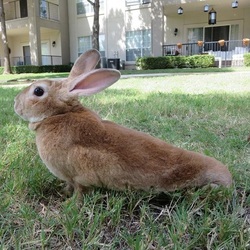 A rabbit with a missing limb/s will be especially prone to sore hocks because the remaining limbs have to do the job of what is normally four legs. See our Sore Hocks page for more information on preventing and treating sore hocks. It is important to keep a missing-limb rabbit at a healthy weight. Excess weight is not good for any rabbit but can be especially harmful for a missing-limb rabbit as they have fewer limbs to support that weight. Rabbits with a missing hind limb may have trouble using a traditional litter box. Consider a more convenient, low entry litter box like the ones we mention on our Litter Boxes page. A rabbit missing both hind limbs will require a very special setup and help keeping clean. Visit our Bedding and Baths & Cleaning pages for more information on those topics. Rabbits adapt remarkably well to life with three legs (and can even adapt to life with two, if cared for properly). We know lots of little bunnies who get around just fine with a missing leg- they run, hop, play, binky, get into trouble, just the same as any normal bun. Rabbits who lose a hind limb to amputation do take a bit longer to regain their footing than buns who lose a front limb (just because of a rabbit's natural reliance on their back legs), but they do learn to adjust to their new way of hopping. Though there are still some owners and professionals who advocate euthanasia for a simple broken leg, there are tri-pawed rabbits all over the world who are still living quality lives and we urge people, should they face amputation, to give their bunny a chance- they will surprise you with their ability to overcome life with three legs.